Long overdue. Has always wanted to upgrade my non-nested NSX-T environment which was still running on 2.1 but putting on hold because I wanted to blog about and record the upgrading process. The big motivation for the upgrade was due to the Pivotal Application Service(PAS) as there were some significant improvements for Load Balancer with NSX-T version 2.3 . I already had PAS version 2.3 installed but not started with the NSX-T tile yet. With this upgrade, then I can proceed with the NSX-T tile installation. Lets get started! 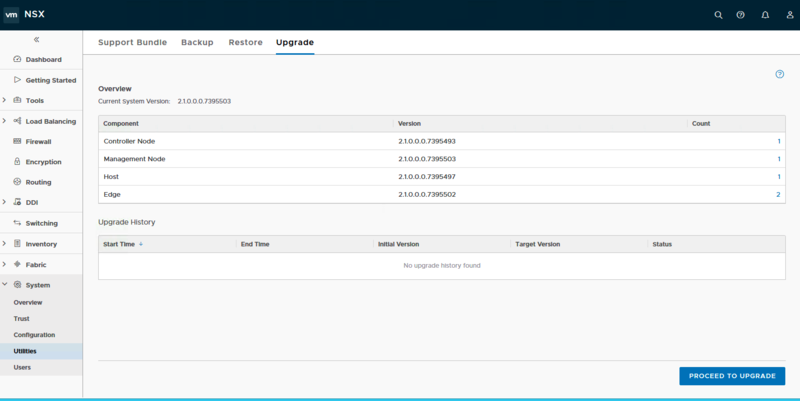 Under Utilities in NSX-T Manager, there is this upgrade tab. Uploading the MUB file. Filename: VMware-NSX-upgrade-bundle-2.3.0.0.0.10085361.mub (~7.5GB). Make sure the hosts are in maintenance mode before you start with the Hosts Upgrade. Console of the Edge VM01. Successfully upgrading the NSX-T Edge VMs. Successfully upgraded the NSX-T Controller! Warning message to inform any activity towards the NSX Manager will result in errors. NSX Manager upgrade in progress..
After a reboot of the NSX Manager and some refreshes of the NSX Manager, I guess the NSX-T Manager was also successfully upgraded! All and all, with me taking some screenshots here and there, total time taken is about 50 mins. Impressive and zero command line or CLI, everything on the UI! I am also very pleased with the Upgrade Wizard which lay out the sequence step by step which removes all the confusion for customers on which components to upgrade first, second and subsequently. I also have a continuous ping running on one of the linux jumphost which is on the NSX-T overlay network. I have been occasionally looking at the console of the screen and did not notice any ping drops. After I break the continuous ping after the upgrade, I saw there is 0 packet loss. Super Impressive I would say!